Clam is a generic term referring to any type of bivalve mollusc other than mussels, oysters or scallops (of course, not all species of such molluscs are edible). There are many ways of preparing clams, for example, raw, baked, boiled, fried or steamed, as well as in clam chowder (from New England cuisine and Middle Atlantic cuisine) or with pasta (in many Italian recipes). Snow's by Bumblebee chopped clams in their natural juices, hearty in size, are perfect for chowders, seafood soups, and stews, sauces, or any seafood recipe to which you want to add the special taste of Snows by Bumblebee. 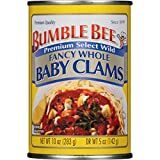 Typically 200 - 300 clams (yellow clam species) in each can, BUMBLE BEE Fancy Whole Baby Clams are perfect for pasta sauces, dips and chowders. Delicate in flavor and firm in texture, Smoked Baby Clams in Olive Oil are packed from the freshest clams available in cold pressed olive oil. Frozen clams are never used. This ensures that the product has a delicate smoke flavor with a firm texture. Only clams of uniform size and color are used. Our Clams are sustainably harvested from China and are the only Smoked Baby Clams on the market - Natural or Grocery trade - packed in olive oil. BUMBLE BEE Fancy Smoked Clams are steamed, shucked by hand, graded, and then smoked in large 'smoke boxes'. Smoking comes from natural hardwood, usually cherry wood. Air is restricted in the box, which makes the wood smoke rather than flame. Our clams are smoked for about 25-40 minutes and then placed in cans by hand, filled with vegetable oil and sealed. Perfect for hors d'oeuvres, snacks, or party food. BUMBLE BEE SNOW'S has been a high-quality canner since 1920. Expect only the best from BUMBLE BEE SNOW'S as we are the only domestic manufacturer to harvest our own clams. We pride ourselves with using the freshest ingredients to make our products. That's because we believe in making quality products you will feel good about serving to your customers. Better than Bouillon Concentrated Stocks are made with Roasted Chicken, Roasted Beef, Roasted Garlic or Seasoned Vegetables. This gives them a richer, more robust flavor than ordinary bouillons or soup bases. Our chicken tastes like chicken because it IS chicken; our beef tastes like beef because it IS beef. Better than Bouillon Concentrated Stocks are fat free and have 1/3 less salt than ordinary bouillons. 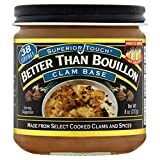 Better Than Bouillon Clam Base is the perfect ingredient for your classic clam chowder. Our Clam Base is made with cooked clams and juices to give your chowder the type of flavor it deserves. Snow's(R) Bumble Bee(R) Minced Clams in their natural juices, delicate in size, are perfect for appetizers, dips, sauces, or any seafood recipe to which you want to add the special taste of Snow's(R) Bumble Bee(R).